Thank You God It Rained!!! Hello everyone I am so happy to see you today! Welcome to Full Plate Thursday. I look forward to Thursday every week because we have so much fun together. I can't wait to see what you have brought to share this week. Thank you so much for coming to share your wonderful food with us and come back soon! What a sweet shoutout for me, Helen. I am so glad you liked my post. That dinner was like *going home* for me, too. My momma always made the best fried chicken...and gravy...and...well, everything she made was so good. No matter if I go exactly by her recipes, mine NEVER tastes as good as hers did. Why is that? Another Thursday full of yummy recipes. Thank you for hosting it again, Miz Helen. Today I decided to share two Italian family recipes...Bruschetta and Ricotta Ravioli. Mmmm! You made some great selections from last week! Thanks for hosting again this week! Thanks so much for the shout out! I love your story about sharing food! I wish I had more friends close by to share food and good times with. Thanks for letting me share on your blog! Great featured recipes again! I'm especially interested in the Chocolate French Toast. oh yum, the Chocolate French Toast caught my eye too. Thanks for hosting, Miz Helen. So many great recipes! Thanks for hosting, cher! Thanks for hosting. I always love to see how you filled your plate. This week I'm sharing a pulled pork recipe. I have a page on my site that lists more than 250 hops, memes, and photo challenges… some for each day of the week. Yours is listed there. Check under the header for the link to that page. I’ve also started a BlogFrog community that focuses on hops, carnivals, memes, and photo challenges. Go to http://theblogfrog.com/1504201 to visit & participate. Thanks for always leaving the nicest comments. My family and I are fine...just way too busy lately it seems. The end of the school year is always extremely busy no matter what adjustments I try to make for that. Yesterday was my first no-school day. It was so nice just to relax. Thanks for the party, Miz. Helen!! Summertime dinners really need some potato salad, so here's a variation on my mother's recipe. I subbed some agave nectar for the little bit of sugar, and added some bacon for variety. It would go really well with some of the pickles from your pickle pot! Miz Helen, thank you for hostessing... I brought a sweet treat to share! Hi Miz Helen! I'm sharing a favorite cooler from the Philippines called Halo-Halo! I'm back again this week. Finally had something with a picture to share. Now to check out the other yummy things. Thanks for hosting! I always love seeing your site! Lots of your foods look amazing! Hi Miz Helen! Thanks for hosting FPT. I am sharing my recipe for Healthier Queso Dip. It's perfect for lazy summer evenings! Looks like you already have tons of great recipes linked! I had cheesecake this week and thought I'd share. Have a wonderful weekend! Good afternoon Miz Helen! This week I'm sharing a vegetarian take on chicken salad. Thank you for another week filled with delicious recipes to try! Yum!!! 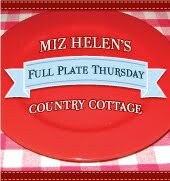 This is my first time ever for participating in Full Plate Thursday! You have quite a following. Hi Miz Helen, I've shared a yummy Strawberry Rhubarb Crisp/Topping recipe for all to try and to enjoy! Thanks for hosting!!!!!! Thank you so much for filling your plate with my rhubarh nut bread! I appreciate it! I read the beginning of your post and laughed, since I am hoping for rain myself right now. In Texas I bet it hardly ever rains in the summer. I love the down home feel to your blog, Miz Helen, you're doing a great job! Hi Miz Helen, I've just linked up a bowl of pasta in chicken soup. Thank you for hosting!